Meet Mo the Momentum: Our Fifth Wheel Toy Hauler - Eat See RV! We did it! We bought our new home, a 2017 Grand Design Momentum 328M Fifth Wheel Toy Hauler! She’s just under 36 ft. (35′ 11″) and is about 300 sqft. We’ve named her “Mo”. She’s everything we imagined and we’re beyond excited to call her home! If you know us personally, you know we planned this RV purchase and lifestyle switch for nearly two years. We researched, read blogs, watched videos, shopped and walked through tons of RV’s to get a feel for different layouts, styles, and makes. With all of the extensive research we had done, we came to a consensus of three different make and models we were willing to purchase if we found them at the right price. We personally saw and walked through all of the models we liked except one, Grand Design. It’s a newer Fifth Wheel company, and we found them online. Unfortunately there hadn’t been any in Florida for us to check out. We had been planning a trip to the Tampa RV Show in January 2017 to check out all the new latest floor plans, upgrades, and designs, but also because Grand Design had a large booth that would allow us to get inside the model we were interested in. If we liked the floor plan and feel of it once were inside (and the price was right of course), we said we would make this our coach. After spending some time in it, asking lots of questions, and working the numbers, we walked away with a brand new (from the factory) Fifth Wheel that weekend! 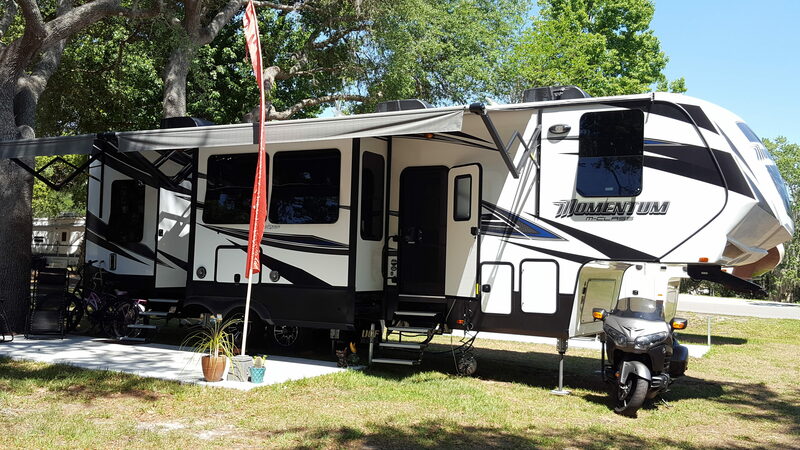 She was delivered the first week of March to Wekiva Falls RV park in Sorrento, FL, the park we’ve been staying at full time until we could hit the road that June. We spent three months in the coach before hitting the road which we are very grateful for. It gave us time to acclimate, get to know how she operates, and make changes to optimize her use and storage. We are living on her full time after all. Overall, we’re super happy with our decision, and really love our floor plan. It’s one of the main reasons we decided to go with Grand Design. We have a full size pantry and a very useable kitchen. I love to cook and needed the space to store all of our yummy food & ingredients as well as the prep area and cook space to bring my dishes to life. We also love the finishings on the coach. The color scheme, cabinetry, counter tops, and flooring choices gives the coach a modern feel that seemed more neutral than some of the designs we saw on other coaches. Also because it’s under 36 ft. we are able to park the Fifth Wheel in a lot of National and State Parks (there are size restrictions – the bigger you are, the less places you can park). Of course we have made some modifications and improvements to make her our own and optimize space, but we’re enjoying her immensely. Maybe we’ll see you “Mo”sing around.